Wooden coolers are one of the ways to spruce up the patio. With this type of ice chest, it will add to the beauty of your courtyard giving it a vintage outlook. A lot of great benefits are attached to wooden ice chests – considering most of these boxes encase a hard cooler inside, the wood protects the cooler exterior from harmful rays. 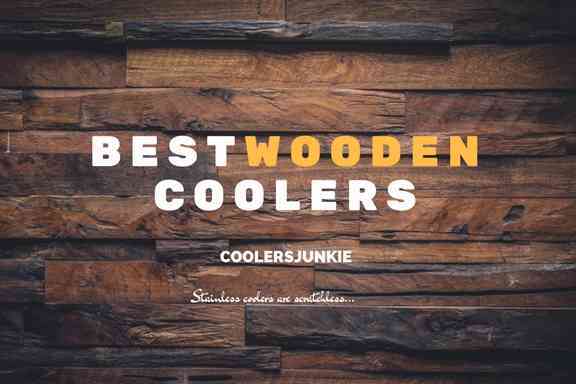 We all like the feeling when people compliment our choice in products, and that’s precisely what these wooden coolers will give you. Wooden rustic coolers will add a chic to your style. But not just any product will suffice, right? Yes – you are right on this one. That’s why our work here at coolersjunkie is to rid you of all the junks and hook you up with the top-rated options out there. First off, the cooler is made of eucalyptus hardwood and oil-based stain – the eucalyptus is special type of wood that is attractive, easy to care for and surprisingly durable. On the other hand, it features a thick sized wall in the interior that incredibly adds to the cooling performance. Coming with a 54.8-quart capacity, the merry rustic cooler will store lots of drinks and food. With that said, it includes a drain plug for complete water drainage, so you don’t have to eat soggy sandwiches. The steel handles allow for easy carrying. Costing a mere half of the average price for hard Rotomolded Chest – it’s the perfect choice for users on a budget. Some users received the cooler in a bad shape – hence the complaints stretched from missing screws and broken parts. Aside from that, there’s nothing you should worry about. Design conscious cooler fan? The leigh county will add décor to you courtyard: it’s has a sleek appearance, large size, and durability will make you love it. The rustic grey wash finish gives the cooler a bad boy look. Bad is good – only applies to the leigh country cooler. With a 54 quart capacity, the rustic wood can store more than 30 cans plus ice. The interior has a polyurethane liner for easy cleaning, while it is power coated with premium materials to prevent rusts. Some nice features you’d be interested in – bottle opener and a drain valve to purge out water without tilting the rustic chest. How well does it keep ice? It can hold ice for a day. Sure it doesn’t hold ice as you’d expect but it gives a stellar performance in strength. The lid is flimsy – but some users have said adding changing the hinges will solve the problem. The lifoam mountain scene is great rustic cooler for an affordable price. Whether it’s tailgating or BBQ in the backyard, this is the perfect piece of equipment for the job. It’s built with galvanized steel liners making it resistant to rust and leaks, while thick foam insulation increases the ice retention of the lifoam. The rustic chest has a vintage look to it, and the emblem on the cooler adds to the vintage aesthetics. There’s an easy to clean drainage spout which rather drains water well. The lifoam measure 18.12″L x 26.87″W x 31.12″H. and the 57-quart sizes accommodate up to 64 cans and ice. Among the wooden ice chests we’ve reviewed, the Cambridge willow is a class favorite. The mahogany wood construction should make you smile. You’ll like the polyurethane weathered finish; durability is what you get from this product. It features flip-up lids provide easy access to items. The cooler is solid and can be used a seat to relax and enjoy the savor of drinks and grilled meat. Unlike other patio coolers, the Cambridge willow comes in fully assembled. The brass chromed steel handles greatly increase the ease of carrying the cooler. However, if it’s filled up, you may need a hand to lift the cooler. The backyard discovery holds true to its name cause using this cooler makes you feel as though you’ve found gold in your backyard. Cleary; this wooden cooler has the physical embodiment of strong and amazing. With iron wheels it allows you to cart the cooler around. Handy towel holder and bottle will spice up your patio experience. If vintage is what you want, vintage is what you’ll get here. Designed with Chinese cedar which inherently repels pests and prevents rot, so you don’t have to worry about the cooler getting ruined by exposure to water. Some reviewers have reported the sub-standard quality of the quality. However, the 1-year manufacturer’s warranty covers 5 parts, meaning you have little to worry about now. The backyard discovery is completely capable of multi-purpose use. Whether it’s tailgating, bbq or a family and friends get together; the ice chest is an excellent choice. Wooden coolers are one of the most efficient ways to give a face-lift to your patio. Because the coolers are in-cased in the wood, the menace of outdoors wouldn’t destroy the cooler, thus, you will be able to use it for years to come.